Urban runoff is often the primary source of ocean pollution. Ocean Friendly Gardens (OFG) educates and assists people in creating landscapes that utilize native plants (follow this link for more info about native plants and what plants are native to Virginia), permeable groundcovers and water retention features to prevent urban runoff, create wildlife habitats and design beautiful spaces. Vegetable gardens can be OFGs too, as long as they apply CPR: Conservation, Permeability and Retention. In 2015, Virginia Beach Chapter volunteers partnered with Seatack Elementary, An Achievable Dream Academy, to build the first OFG in Virginia Beach. 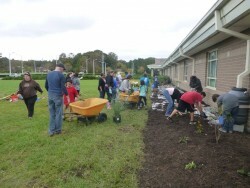 Students, parents, teachers and Surfrider volunteers planted the garden in the front of the school to prevent roof runoff from making its way in the storm drains. If you would like to volunteer for Ocean Friendly Gardens or have an idea of where one could go, please contact Nick at chair@vb.surfrider.org.